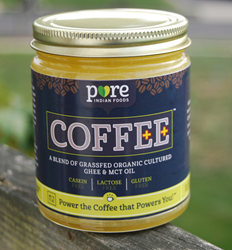 Pure Indian Foods is pleased to announce their newest product, Coffee++, a cultured ghee and MCT oil blend. As the world’s first ghee & MCT oil blend, Coffee++ simplifies paleo butter coffee, and it’s made from the highest quality of grass fed organic cultured ghee. With its 2:1 ratio of cultured ghee to MCT oil, Coffee++ provides the perfect solution for those looking to add healthy fats to their diet as a source of energy. It can be easily enjoyed by adding 1-2 tablespoons to an 8-ounce cup of hot coffee, or for a frothier and creamier taste, Coffee++ and your cup of hot coffee can be blended. Though the process of adding butter to your coffee has been common practice in India for quite some time, *Bulletproof® Coffee has recently become popular thanks to Dave Asprey, founder of The Bulletproof Executive. Those looking to maintain a paleo diet lifestyle can rejoice at the notion of adding ghee, MCT oil, or both to their coffee. Pure Indian Foods is a leading online retailer for organic grass fed ghee made from non-homogenized milk. Agarwal is a 5th generation producer of ghee, with his great-great-grandfather opening a ghee business in northern India in 1889. For a variety of organic ghees, including several spiced ghees, visit Pure Indian Foods. *Bulletproof® is a registered trademark of Bulletproof Digital, Inc.